One more card before heading back to work tomorrow! 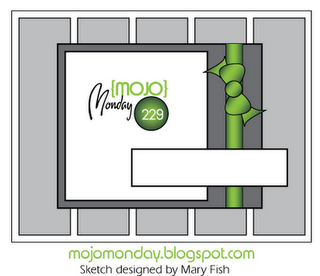 The Mojo Monday 229 Sketch was my inspiration for this card. I also used my favorite stamp set from the 2012 Occasions Mini - You're My Type. 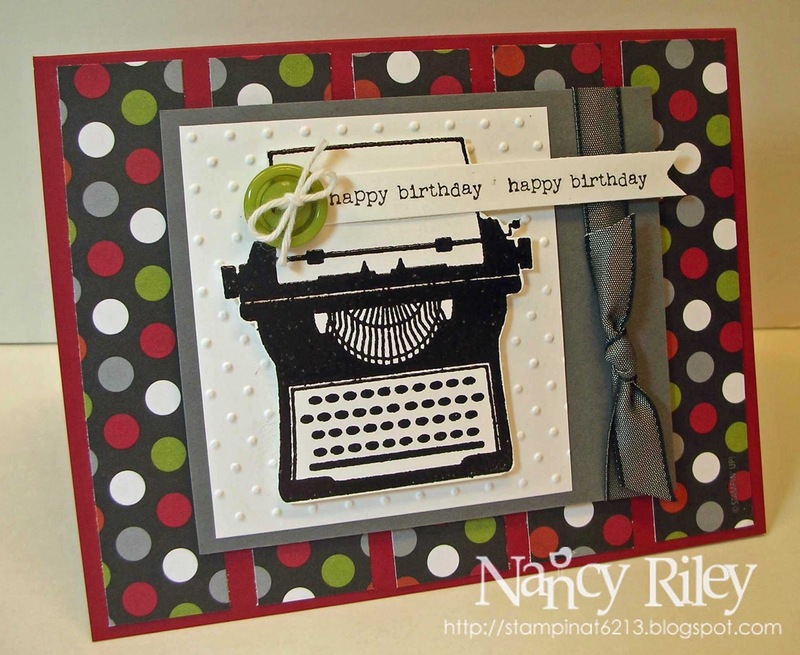 I just love this old fashioned typewriter! 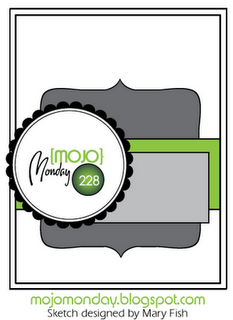 Click HERE to shop Stampin' Up! products 24/7. I am so enjoying my stamping time over this three day weekend! 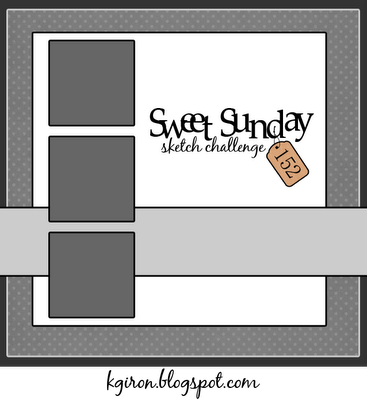 Karen Giron's Sweet Sunday Sketch Challenge 152 gave me the inspiration for this card, and I used FREE products from 2012 Sale-A-Bration! - Fresh Vintage Stamp Set, Everyday Enchantment Designer Series Paper, 1/8" Organdy Ribbon and 3/8" Printed Designer Brads. 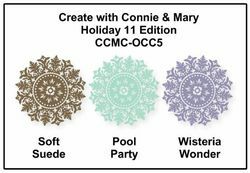 Here's a simple little card I made this weekend using one of my favorites stamps, Triple Treat Flower and two challenges, Create with Connie & Mary's Color Challenge of Soft Suede, Pool Party, and Wisteria Wonder and Mojo Monday Sketch Challenge 228. 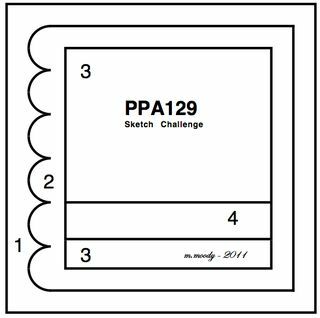 The card measures 4 1/4" x 4 1/4", and the embossed Top Note Die shape is cut in half horizontally and overlapped to fit on the card front. 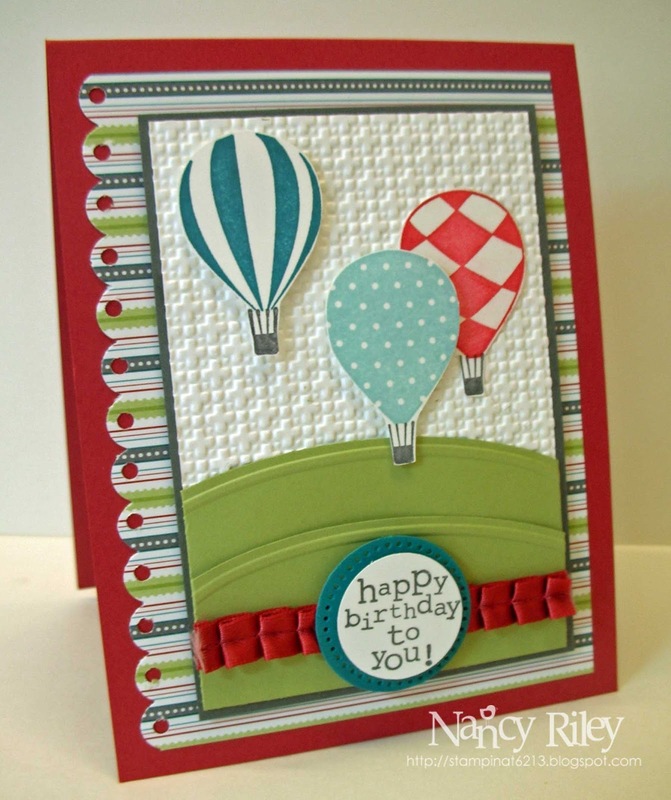 This card uses the stamp set Up, Up and Away. It reminds me of all the hot air balloons we often see where we live. I always chuckle about our dog Millie (now deceased) and her fear of hot air balloons. She would beg and beg for walks but if there was a hot air balloon in sight, she would drag me back home with her tail between her legs. She was petrified of them! They are noisy when they are low, and she was always sensitive to sound. 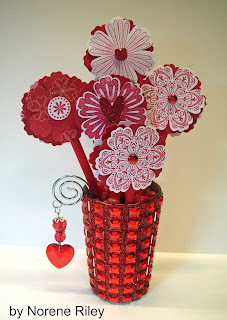 I used the Pals Paper Arts Sketch #129 and a few new items from the 2012 Occasions Mini Catalog including Twitterpated Designer Series Paper, Riding Hood Red 3/8" Pleated Satin Ribbon, and Adorning Accents Edgelits Die and Textured Impressions Embossing Folder. 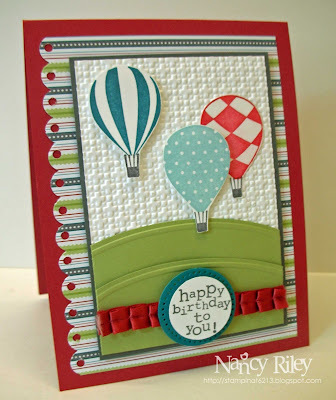 On Saturday, I spent the day at Stampin' Up! Regional Convention in downtown Phoenix. What a great day with great friends! 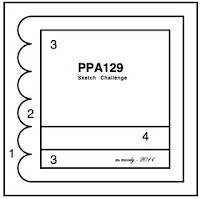 - full of stamping inspiration, helpful tips, new techniques, and very motivating! The other morning, I stopped by my sister-in-law, Norene's house on my way in to work to drop off some stamping tools for her to borrow (we are always trading back and forth), and she had this Valentine beauty waiting for me! 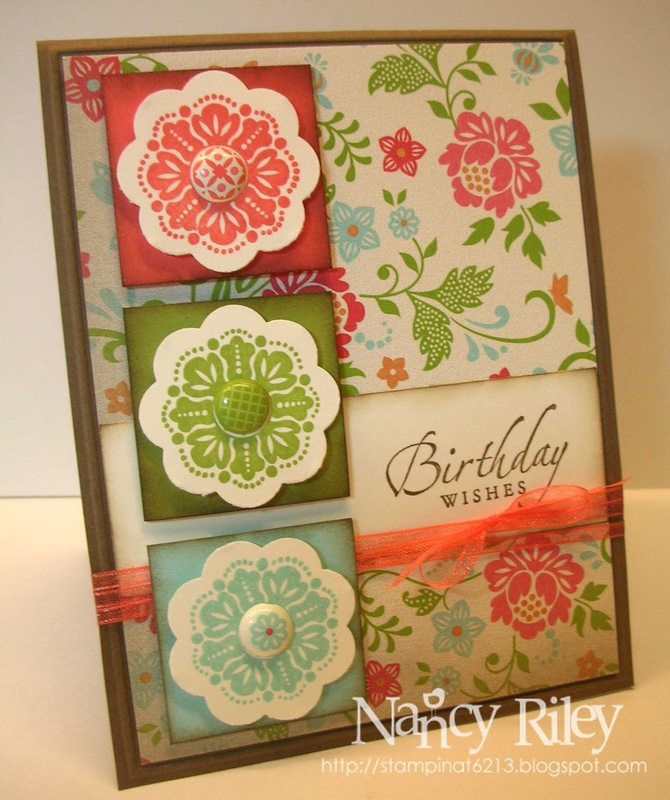 She made the flowers using the stamp set, Mixed Bunch and coordinating Blossom Punch found on page 17 of the new Occasions Mini Catalog. The container is a votive holder with the hanging charm included! I have it sitting on my circulation desk in my library, and the kids have been ooohing and aaahing over it for days! I just love it! 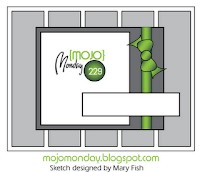 I'll be hanging out at the Stampin' Up! Regional Convention in downtown Phoenix on Saturday. If you're there, be sure to look for our group in our weSTAMP t-shirts!